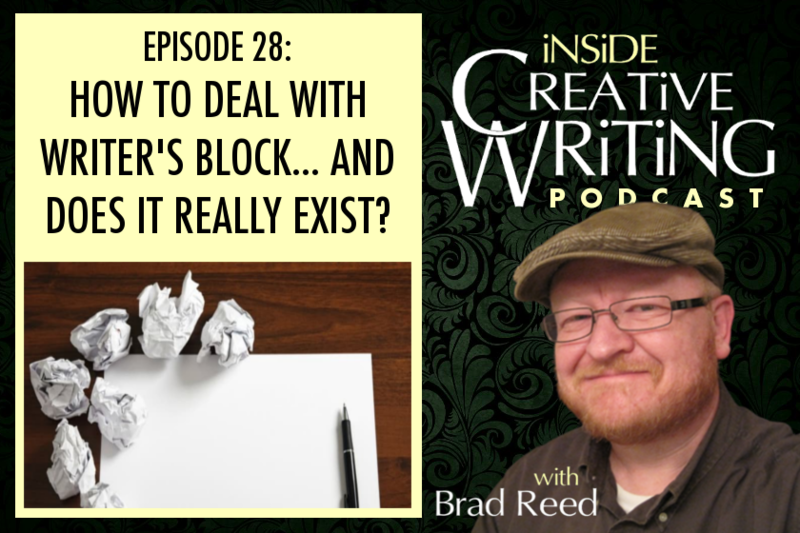 In today’s show, we’re exploring the writer’s nemesis: writer’s block. What is it? Where does it come from? And how can we move past it? So we’re exploring writer’s block today… what it is, what causes it, and how to get past it. I’ll warn you of a couple of things right up front. I have some pretty strong opinions about writer’s block that some of you–maybe even many of you–won’t share or will find hard to accept. I get that, and I don’t expect you take everything I say on ANYTHING as writing gospel. As always, take what works for you and leave anything that doesn’t behind. But I hope you’ll give some consideration to what I’m going to talk about today because I think it can be a huge element in pushing through the really difficult parts of writing and into a place of productivity and creativity. So let’s start with probably my most controversial take on writer’s block. I don’t believe it exists. That’s right. I don’t believe that writer’s block–at least not in the sense that we usually think of it–is a real thing. If we mean that there is some process that takes place in the writer’s brain that occasionally just turns off the water spigot of creativity and forces us to sit in front of a keyboard with a sense of panic and fear, then no, I don’t believe in that. Now, perhaps you think of writer’s block as something different–maybe just a reluctance to write or the frustration that sets in when you struggle to write a scene or aren’t sure what to write next. Well, that’s just writing folks. Writing is full of joy and excitement and creative insights, but, by its nature, those moments of struggle and panic and self-doubt are just a natural PART of writing. Writing is like solving an incredibly complicated puzzle. We don’t get “puzzling block” when we are stuck looking for the right piece. We know it’s out there somewhere and we just keep looking for it and trying out various pieces until one clicks. That’s the world of writing, too. But that’s taking us temptingly close to the solution we’re going to talk about, so I want to leave that puzzle analogy there for a moment. Alright, so let’s jump into controversial claim #2: I think the idea of “writer’s block” has come about as a means to justify procrastination. Now I can feel some of you gritting your teeth now, and probably cracking your knuckles to get ready to send me a flaming email or tweet. I don’t mean to minimize the fear and frustration that people experience with what they call writer’s block. I know it can be incredibly debilitating and even start a downward spiral of self-defeating behavior. I don’t make this claim lightly, about writer’s block being just another form of procrastination, but I am making that claim. And here’s why. I hope you’ll follow me. Yes, as writers, we are artists. There is absolutely some sort of almost mythical alignment of stars and muse and perfect cup of coffee that results in bursts of astounding creativity and productivity. But, as writers, we also have to see it as our job, even if we don’t do it for a living or ever make a dollar at it. We are seeking to create a product for a consumer. A book for a reader—a screenplay for a producer. If you remove the artistic halo from the act of writing (which is admittedly hard to do), it boils down to producing a product, or you could even look at is as part of the service industry. We are seeking to entertain or inform our audiences with our writing. And, once you look at writing as even just a little bit “business,” it becomes clear how writer’s block sounds like a concept that can’t be backed up. Let’s take a plumber, for example. I can’t imagine that plumbers wake up every day excited and joyful about plumbing. I’m sure there are days that it’s the last thing they want to do. I’m sure they have off days where they’re not even very good at it. But they get up and they plumb. There is no such thing as plumber’s block. A plumber never sits in front of a job, even if it’s an incredibly complex one, and finds that they can’t do anything. No, they jump in and maybe make a total mess of it but eventually figure it out or call someone else in who can help them. Years ago–decades now–I used to be a letter carrier for the postal service. I hated that job. Towards the end, there was nothing I felt less inclined to do than go out and deliver another days’ mail. I know that probably sounds insane to you. From the outside, it looks like a pretty chill job. But on the inside, dealing with all the insane rules and overbearing management, it was miserable–at least for me. Anyway, that’s beside the point. Even on my worst day, I never had a case of mailman’s block. I may have done a terrible job, may have even required another letter carrier to come and help me finish, but it got done. Mail got delivered. So, essentially, here’s what I’m saying about the concept of writer’s block: Unless you’ve literally lost the use of your hands or are injured or disabled in some way that absolutely prevents you from writing, you don’t have writer’s block. You’ve got something else going on that is legitimately really hard to deal with. It would have to be for writer’s all over the world to come up with the concept of writer’s block in the first place. But here’s the thing. You CAN write. You could put your fingers on the keyboard and write something–even if it was pure gibberish. You could scrawl a few words across a piece of notebook paper even if they were random words from thin air. You CAN write, so you don’t have writer’s block. Okay, so even if you haven’t completely bought into my claims about the non-existence of writer’s block, I hope you’ll listen through some of the techniques to break through whatever is hindering your writing. The good news here is that these things will help whether you accept my previous premise or not. All of these ideas are based on one simple truth. Writing begets more writing. In other words, once your brain and hand are in synch and putting words on the page, it’s more likely that the creative system will kick back in and work. I think of it like push-starting a car. I drive a restored old 1963 VW bug named Lucy so I know a thing or two about jump starting a car. So the car is dead–no battery. No power. To get it started without a jump-start from another battery, you got to push it. Get it up to as fast as you can, leap into the driver’s seat, pop it into gear and let out the clutch. What happens is the engine starts turning because of the forward momentum of the wheels on the ground. The crankshaft turns, the pistons move up and down, the fuel pump squirts a little fuel. The car isn’t really running yet… it’s still dead… but everything is moving AS IF it’s running. Then, at some point, if it’s rolling along fast enough, a spark plug will fire and set off that little explosion that turns the engine. Then your engine is actually running and you’re off down the road. That’s essentially what these techniques are designed to do. Give your brain a push-start so it starts going through the motions until the engine fires and you’re off and running. There’s one other aspect of this analogy that I think is really important to understand. When you’re push-starting the car, you don’t care about what direction you’re headed. If there’s a downhill slope, you’re definitely pushing it that direction so you can build up even more speed. In other words, the act of push-starting the car is not part of the getting where you want to go. All you’re really trying to do is get the dang thing running so you can go where you actually wanted to go. Some of these techniques work the same way. They may not feel like they are related to what you’re actually trying to write at all, but they ARE working to get the system fired up and running, so there is value. What I’ve found, though, is even when I think all I’m doing is jump-starting my writing brain, I usually find value in what I’ve written to do it. Okay, here goes… the techniques. We’ll start with my favorite one. Write about what definitely WILL NOT happen next. If you are stuck because you have no idea what the next scene is going to be, start writing the scene that you absolutely KNOW won’t be what happens. If you’re trying to get a couple to fall in love, write about a huge fight where they break up. If you’re trying to come up with an inciting event that will kick your story into gear, write the opposite. Attempt to write the world’s most boring scene where absolutely nothing happens. If you’re stuck writing an ending— this is usually where I get stuck— then write a joke ending or a tragic ending if it’s supposed to be happy. The point of writing the opposite of what you’re trying to do is that it by-passes the perfectionism program in our heads that is so often the real reason for what we call writer’s block. It gives us license to write a piece of total crap because we never intend to use it. It even allows you to have some fun with what you’re writing, which is HUGE in the middle of the panic and desperation of being stuck. And, more than once, it’s been through writing what definitely WON’T happen that I’ve discovered the actual thing that WILL work and taken off into a writing fever. I’ve even tried this technique and discovered that the thing I thought was the opposite of what should happen is what the story really needed. You’re ready to get the lovers together, for example, but what your story really needed was a fight to add to the tension and conflict. Like I said, this is my favorite one. If you’ve never tried it, I hope you’ll give it a whirl. Even if you’re not stuck in something you might call writer’s block, it can be a great warm-up exercise before you get down to the serious work of actual writing. Our second technique is one I hinted at as a Weekly Challenge on the podcast, oh, I don’t know, a month or two ago. This technique asks you to write a letter from your character to yourself as the writer. I like this one because, again, it’s not something you’ll actually use in your story so it removes all the pressure to write something good. It also breaks you out of the perspective and story world you’ve been writing in which can sometimes shakes things loose. There’s a few different ways to approach this letter. My favorite is to actually write two letters, one from my character as if they are writing to me before I’ve written the story and one after I’ve finished it. In the first letter, they are telling me about the kinds of things they hope I will write about them. They are worried about how I will portray them in the book and are trying to influence me to present them to the world in a positive light. The second letter is after the book comes out and they are furious with me for what I’ve written. What things did I reveal about them that pissed them off? How do they feel like I misrepresented them or left out key things that they wanted included? This can be a really fun form of writing, too. It’s a blast to get into the minds of your characters and let that awful writer know exactly how you feel. What’s really great about this kind of writing is that it can’t help but teach you something about your character that you didn’t know before. It is sometimes during this kind of writing that I discover what my character’s inner weakness is. What their character flaw is. At the very least, it’s gotten your creative engine turning and given a spark plug the opportunity to fire it up. One last one we’ll look at is one I’ve toyed with but never invested in fully, but many writers swear by it. That’s the idea of keeping a writing journal. John Steinbeck journaled consistently during the writing of most of his books and it makes for absolutely fascinating reading. He was often convinced he was writing a complete piece of crap while he was working on The Grapes of Wrath! His journals from that time period show a man wrestling with some pretty severe demons and what we might want to call writer’s block at times. He used his journal as a warm-up before he got around to working on his novels. He’d write about what was going on in his life, who had come to visit, how he was feeling about his manuscript, what his plans were, and then he’d dive in and get the work done. Something about the process of putting words down on a page primed the creative pump for him and the same thing will likely work for you. If you’re a fan of The Grapes of Wrath, or any of Steinbeck’s work for that matter, I recommend you pick up a copy of Working Days: The Journals of The Grapes of Wrath. I find it oddly inspirational to see the behind-the-scenes struggles of one of my favorite authors while writing one of my favorite books. So those are three techniques that I find particularly effective in getting things moving again when I’m stuck in my writing, and I hope you try them out and have some success with them as well. One thing I didn’t fully flesh out from my push-starting a car analogy is the idea of help. Sometimes you can’t push the car fast enough to get it started. Sometimes you need a good Samaritan to come along and help you push or, better yet, pull a set of jumper cables out of their trunk and get you back on the road. This is equally true of writer’s block. If we try to tackle it alone, we may not always have the energy or strength to push through it. Sometimes we need help. I know it often helps me to sit down with someone I trust and just talk through what’s going on–not so much about the actual block I’m facing–but about what I’m trying to accomplish in the story. The brain uses different pathways when it’s speaking about something than when it’s thinking about something and sometimes these new pathways are the key to unlocking whatever was stuck. Either that or your trusted writer friend sees things in a new perspective that gives you the insight you need to get moving again. This is one of the things I actually love about the Twitter writing community. It’s not so much that people are helping each other with actual writing on Twitter, but it’s definitely where I’ve met the trusted friends I turn to when I need somebody’s help. Speaking of Twitter, I’d love to connect with you there and have you as part of my writing community. I’m at @bradreedwrites if you’re interested. We’re going to leave our exploration of writer’s block there for today. I’d really love to hear from you about today’s show. I’m guessing I struck some nerves and that you probably have your go-to techniques for pushing through the rough times as well. What I’d really love for you to do is to call our message line and leave us some feedback that we could use on a future show. I’m going to give you the phone number here in a minute so this is your chance to find a pen or ask someone riding with you in the car to jot it down. When you call, let me know your name, where your calling from, and you can even mention your Twitter handle or website or whatever, and then tell me about your reaction to the show along with any techniques you use to get through writer’s block. Okay, the number is 541-952-2406. Once more 541-952-2406. If you’re not in a place where you can write it down, just click the Talk to Us link at www.BradReedWrites.com. I’m looking forward to hearing from you, and to hopefully getting your voice on a future episode of the podcast! We’ve talked a lot about writer’s block this week, so instead of just using one of the techniques we talked about in the show, I want to flip things a little bit. This week, I want you to reach out to a writer friend and have a conversation about writing. Perhaps you’re feeling stuck and just need someone to talk through it with. Or, better yet, you find a fellow writer who is stuck and take the time to help him or her sort through whatever they are dealing with. This could be in person, on Twitter, in a writer’s group. Whatever. Just try to connect with someone who you can lean on and who can lean on you when your creative car is dead and needs a push-start. Next Post:Episode 29: What is “Theme” and How Can We Use it to Engage Our Readers?